The share of adult cell phone owners who have downloaded an app to their phone nearly doubled in the past two years – rising from 22% in September 2009 to 38% in August 2011 – according to a new survey by the Pew Research Center’s Internet & American Life Project. The share of U.S. adults who purchased a phone already equipped with apps also increased five percentage points in the past year, from 38% in May 2010 to 43% in the current survey. When both groups are accounted for—those whose phones came equipped with apps and those who have downloaded their own—fully half of U.S. adult cell phone owners (50%) now have apps on their phones. In May 2010, that figure stood at 43%. Looking at all U.S. adults, 42% now have cell phones with apps. In addition to examining mobile app use on cell phones, the current survey included questions about mobile app use on tablet computers. It finds that among the 10% of adults who currently own a tablet, three-quarters (75%) report downloading apps to their tablet. This translates to 8% of all U.S. adults. The vast majority of tablet app downloaders (82%) have also downloaded apps to a cell phone, thus there is considerable overlap across the two groups. Overall, when cell and tablet app downloaders are combined, 34% of adults report downloading apps to one or both of these devices. These findings are from a survey conducted from July 25-August 26 among 2,260 adults ages 18 and over, including surveys in English and Spanish and on both landline and cell phones. The margin of error for the total sample is plus or minus 2 percentage points. An “app” is an end-user software application designed for a mobile device operating system, which extends that device’s capabilities. Apps were first introduced in early 2007 with the Apple iPhone. Since then, they have become increasingly popular as other smartphone platforms and now tablet computers have embraced this form of accessing content. Indeed, app use has been a core feature in the broader move away from desktop computers toward mobile computing on handheld device. While the portion of adults downloading apps has grown since 2009, their demographic profile has not changed markedly, even with the addition of tablet computers to the mix. App downloading on cell phones remains concentrated among young adults, those with higher incomes and education levels, and those living in urban and suburban areas. In May 2010, cell phone app downloaders were also disproportionately male when compared with the full U.S. adult population, but the gap between men and women has decreased. Adults who download apps to tablets (the majority of whom are also cell phone app downloaders) skew slightly more female and older than cell phone app downloaders in general. They also tend to be from higher income households, and more highly educated. The growth in apps downloading is a reflection of the broader trend toward mobile devices the Pew Internet Project has identified over the past decade. Americans have embraced mobile connectivity in the form of laptops, smartphones, tablet computers, and e-readers, while desktop computers have become less popular over time. In February of 2010, Pew Internet reported for the first time that laptops had overtaken desktops in popularity among 18-29 year-olds, and in the current survey, laptop ownership (57%) has equaled desktop ownership (55%) for the full adult population. Moreover, in May 2011, Pew data showed that 35% of adults in the U.S. owned smartphones. Yet app downloading and use, while growing rapidly, is fairly low given the wide range of activities U.S. adults now engage in on their phones. Because many of these activities require “apps,” one might expect the percent of cell owners who download apps to perform these popular tasks (such as email, playing games, listening to music) to be higher. Having apps and using apps are not synonymous. In May 2010, Pew Internet data showed that only about two-thirds (68%) of adults who had apps on their phones reported actually using them. The current survey asked those who reported having apps on a cell phone and/or tablet computer how many apps they use on each device at least once a week. Among adults who have apps on their cell phone, roughly half (51%) use a handful of apps at least once a week, while 17% report using no apps on a regular basis. Almost a third (31%) could be called app “power users” in that they use 6 or more apps on a weekly basis. Among adults who have a tablet computer, 39% report using 6 or more apps on a weekly basis, while just 8% report using no apps regularly on the device. Market data on apps use and downloading indicate that games continue to be most popular and those that adults are most willing to pay for, followed by apps for weather, social networking, maps/navigation/search, music and news. The current survey asked app users if they had ever downloaded nine different types of apps. The most popular among this list were those that provide regular updates about everyday information such as news, weather, sports, or stocks (74%), those that help people communicate with friends and family (67%) and those that help the user learn about something in which they are interested (64%). 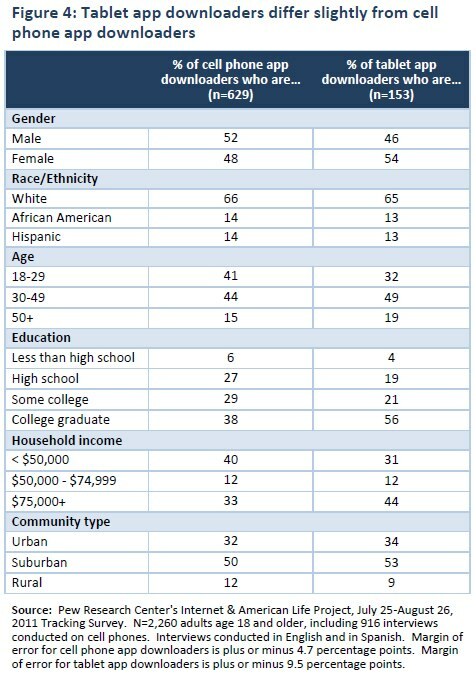 Different types of apps appeal to different demographic groups. For instance, African-Americans and young adults are more likely than others to download apps that help them communicate with friends and family. And overall, men are more likely than women to download apps that help them make purchases and those that help with work-related tasks. The new survey finds that among adult cell phone users who have downloaded apps, just under half (46%) say they have paid for an app at some point; this is unchanged from the 47% of downloaders who said the same in the May 2010 survey. Among those in 2011 who report they have paid for an app, about half (52%) report that the highest dollar amount they have paid is $5 or less. However, 17% have paid more than $20 for an app. Among app downloaders, the groups most likely to pay for apps are men, adults age 30 and older, college graduates, adults with household incomes of $50,000 or more, and those living in urban communities. The introduction of “apps” for cell phones and other handheld devices has been one of the central features of a more general trend toward mobile connectivity in recent years. The “apps ecosystem” surrounding smartphones, tablet computers, and other mobile devices has generated tens of thousands of new features for handheld gadgets. Mobile apps now range from providing specialized content (such as news, weather or health) to games and even “augmented reality,” providing users with detailed information about landscapes, starscapes, buildings, and even people. As noted in Pew Internet’s 2010 apps report, the term “app” has become popular parlance for software applications designed to run on mobile device operating systems, yet a standard, industry-wide definition of what is—and is not—an “app” is difficult to pinpoint. While technically any software that runs on a mobile device is an “app,” our data indicate that most users think of apps as specialized software they download to their phone, tablet, or other device that helps them perform a particular task. For the purpose of this report, apps are defined as end-user software applications that are designed for a mobile device operating system and which extend that device’s capabilities. This new tool for accessing information, media, games, and social networks began to emerge after Apple’s introduction of the iPhone in January 2007. Since then, apps have become more popular as other smartphone platforms embraced this method of accessing content. Further boosting app use was the introduction of Apple’s iPad in the spring of 2010, which has been followed by a succession of similar tablet products such as the Motorola Xoom, Samsung Galaxy, and soon-to-be-released Kindle Fire. The Pew Research Center’s Internet & American Life Project has begun to explore the contours of this relatively new digital phenomenon. In August of 2011, the Project conducted its most recent national survey of the state of apps culture. The survey was conducted from July 25-August 26 among 2,260 adults ages 18 and older in both English and Spanish, 916 of whom were interviewed on their cell phones. 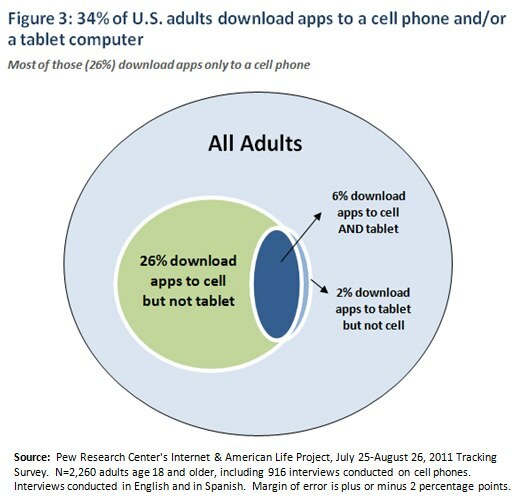 As in prior Pew Internet surveys, cell phone owners were asked about app use and downloading. This survey marks the first time, however, Pew Internet has asked tablet owners about using apps on these newer devices as well. In August 2011, 84% of U.S. adults reported having a cell phone, and of that group, 38% have downloaded an app to their phone. Overall, that means that 32% of all U.S. adults have downloaded an app to their cell phone. This is a significant increase since May 2010, when 29% of cell phone users (representing 23% of all U.S. adults) reported downloading an app to their phone. 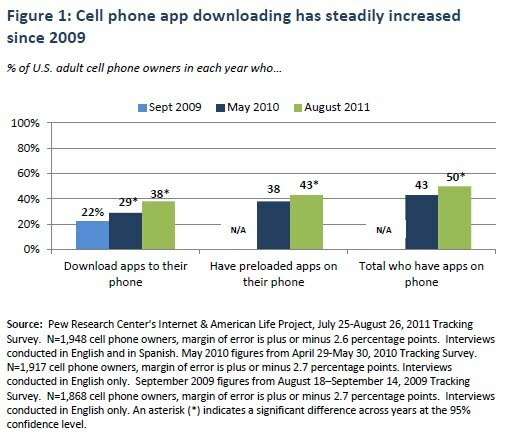 And it is almost double the percent of adult cell phone users (22%) who reported downloading apps in September 2009. In addition, the number of cell users purchasing phones that come preloaded with apps is also on the rise.1 In May 2010, 38% of cell owners indicated that their phone came preloaded with apps—that figure now stands at 43% of cell owners, representing 37% of all US adults. Taken together, that means that half (50%) of cell phone owners (42% of all US adults) now have apps of some kind on their phone—either apps they downloaded themselves, or those that came with their phone when they purchased it. 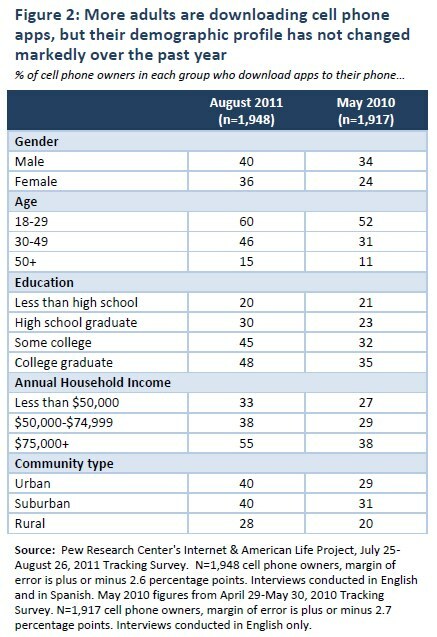 Many cell owners (32%) have both; the overall figure for cell phone app users counts these adults just once. Overall, the current survey shows a seven percentage point increase in the portion of cell phone owners who have apps on their phones since May 2010, with most growth coming from those who themselves have downloaded apps to their phone. The August 2011 survey finds similar results, with 10% of cell users unsure if their phone came preloaded with apps. And again, uncertainty around preloaded apps is highest among cell owners age 50 and older: 15% of cell owners in this age group could not answer this question. In contrast, virtually all adult cell users (99%) can tell us with certainty whether they have downloaded an app to their phone or not. This is true across all age groups. Who downloads apps to their phone? While the overall percent of adults downloading cell phone apps has increased significantly since May 2011, the demographic profile of this group has not changed substantially in that time. In May 2010, Pew Internet found that cell phone app downloaders were younger, more educated, had higher incomes, tended to live in urban and suburban areas, and were disproportionately male when compared with the full U.S. adult population. A similar profile exists in August 2011. While in 2011, the gap between men and women has decreased, downloading apps to cell phones is still most common among young adults, adults with higher education levels and incomes, and those living in urban and suburban areas. Pew Internet data have shown slow but steady increase in tablet computer ownership in the U.S. since the project began measuring the device’s use in May of 2010. To capture the full range of mobile app use among American adults, the current survey included questions measuring app use and downloading among tablet owners. Results indicate that 10% of U.S. adults report having a tablet computer such as an iPad, Samsung Galaxy or Motorola Xoom. [Note: The survey was conducted before the Kindle Fire was on the market.] In May 2010, just 3% of adults reported having a tablet. Among the 10% of adults who currently own a tablet, three quarters (75%) report downloading apps to the device, which equates to 8% of all adults. The vast majority of tablet app downloaders (82%) have also downloaded apps to their cell phone, thus there is considerable overlap across the two groups. One might expect that adults who download apps to tablets are similar demographically to those who download apps to their phones, since a majority of tablet downloaders are also cell phone app downloaders. However, the tablet app downloading population skews slightly more female than the overall cell app downloading population, and is also slightly older, from higher income households, and more highly educated.